Illusion’E Agency is a management agency representing artists appearing and producing music for venues from Ibiza to Seoul. 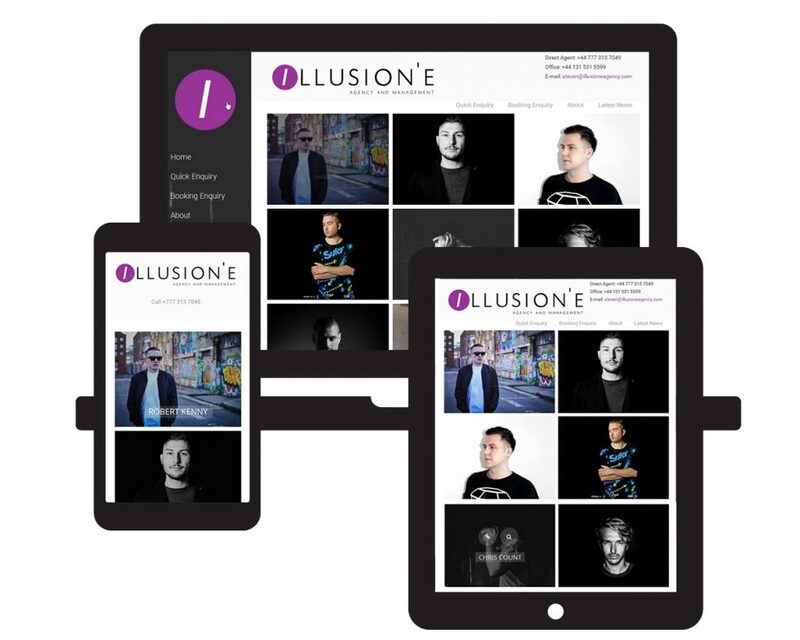 Illusion’E needed to showcase their rapidly expanding roster in a way that was easy to access on mobile devices. It needed to be easy to update themselves and easy to optimise for Google visibility. The site has spam protected contact and booking forms, embedded multimedia, an attractive homepage grid layout with roll-over effects. It also has an unusual dynamic menu system which allows embedded forms and news feeds. The site development time was less than three weeks. Red E designed the simple logo and provided versions for a range of other platforms. We set up newsletter sign-up and fulfilment, handled all Google Search Console tasks and implemented back-up and security fetures for the client’s peace of mind. Technologies: WordPress; 3rd party theme, 3rd party menu system; Essential Grids; Yoast SEO; MailChimp.